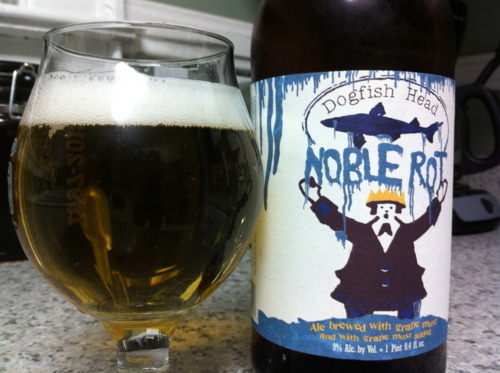 Dogfish Head Noble Rot | Drink. Blog. Repeat. As I mentioned in my previous post about Dogfish Head, the brewery has usually been a hit-or-miss brewer for me, with more misses than hits recently. Their Faithfull Ale was bland, flavorless and boring, and I’m passing on Ta Henket because I haven’t heard a good review about it. But I had heard some really high praise for Noble Rot, so I figured it was worth a shot. The brewing process for Noble Rot – classified as a saison of farmhouse ale – is really intriguing. Unfermented grape must from viognier grapes is infected with botrytis, a fungus that when harvested at the right time imparts a really great sweetness from the grapes. Pinot gris grapes are added to the mix along with pils and wheat malts and additionally fermented with Belgian yeast. The result is part beer, part champagne, part white wine. The beer pours an absolutely gorgeous crystal clear straw yellow. There’s about a finger to a finger and a half of a bubbly white head that dissipates fairly quickly. The smell is of a peppery white wine with that crisp champagne bite. The Belgian yeast and the grapes give off a slight sweetness, but it’s closer to a white wine than anything. The taste is pretty phenomenal to me. There’s that sharp carbonated on the front that helps pop open the taste buds, followed by that richer white wine and champagne flavor that’s coupled with a slight peppery quality and sweetness. It finishes dry and clean, but the sweetness really lingers on your mouth. It’s crazy that this is technically a beer. If you had someone do a blind taste test, they’d likely say it was a wine or a champagne. This was the first win from DFH in a while.